Despite the fact the human computer interface is the main facilitator of communication between the user and the computer system, its importance has been highly disregarded by system designers. This has resulted in many undesirable consequences, and in prescription and other healthcare systems, these problems are aggravated by the fact that not only are the users inconvenienced, but there are potential threats to the well-being of the patients under care as well. Many healthcare systems are often designed without considering the potential users of these systems. Consequently, the systems are created ad hoc, there is general dissatisfaction and eventually most of these systems are abandoned. This wastes human as well as economic resources while creating a stigma among the users towards the use of automated systems. In order to salvage one such system, different methods from the areas of usability engineering, human-computer interaction, psychology and cognitive science are considered, to systematically derive a framework to guide the redesign process. The research undertaken in this project highlights the role and significance of the human-computer interface and puts an emphasis on the importance of user involvement in interface design in order to effectively satisfy their needs. Principles and guidelines for interface design are reviewed in order to obtain the guidance necessary for successful redesign. 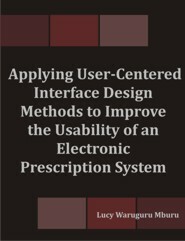 The research also reviews the different techniques involved in the design of user-centered interfaces and filters these to a reasonable set to be applied. Results from the research review, as well as from visits conducted to other healthcare facilities in Nairobi, are also used to pinpoint best practices for designing usable prescription system interfaces. Following the gathering of this information, a series of evaluations are conducted on the abandoned system to identify the flaws that could have caused its failure. Feedback from these evaluations, user suggestions and recommendations as well as best practices are used to iteratively develop an improved prototype system. The redesigned system presents a successfully applied example of the user-centered design framework. A comparison between the original and redesigned system interfaces shows improvements in information quality, interface quality and system usability. Lucy Waruguru Mburu is a lecturer at KCA University, Nairobi, Kenya. She is currently pursuing her Ph.D. at the University of Heidelberg, Germany.